Following on from the traumatic conclusion to the third season, Daisy has left S.H.I.E.L.D. and is trying to solve a series of murders in Los Angeles. And at S.H.I.E.L.D. itself, there is a new director, something which some are coping with better than others while they all secretly yearn for things to be like they used to be. The first thing that strikes you with this episode is how much the status quo has changed. Literally from the opening scene, it feels like a completely different show. Phil Coulson is now back to being an agent, partnered with Mack. The pair are secretly trying to hunt down Daisy, who has now gone rogue as a vigilante called Quake. Fitz and Simmons are now pretty much confined to laboratories meaning they don't spend much time out in the field, something which deep down, seems to be bothering the pair of them. But Simmons has the ear of the new director, which is now causing conflict between herself and May. May also seems to be taking out her frustration on the new recruits, breaking their ribs in practice fights! Things in this episode get really interesting when the series of murders captures Daisy's attention, leading her to track down the thing responsible, described by survivors as a ghost. And with Daisy now finding herself staying in LA for the foreseeable future, Coulson and Mack are quickly on her trail and things get really weird when a gang get seemingly possessed by a ghostly entity trying to enter the world. I really enjoyed the supernatural turn the series seemed to adopt in this opening episode. At first I wasn't sure about the new Ghost Rider, the character is so iconic on his motorbike, but when the flashy car came out of the flames, seemingly alive, I was won over! 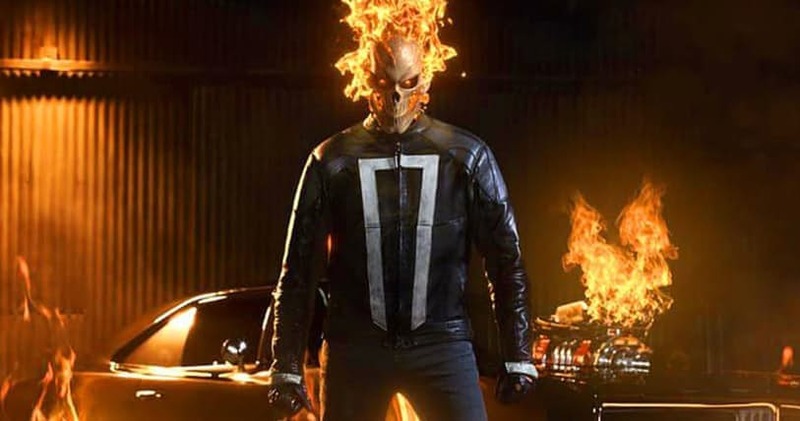 I also really enjoyed the confrontation between Ghost Rider and Daisy at the end of the episode, which does promise a really interesting future meeting for the pair. The one thing I hope will happen now is that the series will introduce other more supernatural heroes and villains from the comics, could Satana and Damian Hellstrom be too far away? And as for the characters, it is interesting to see where they are at and it will be interesting to see how long it will be before they all get back together despite the orders of the new S.H.I.E.L.D. director, who at this point, is only mentioned. There is also some interesting material given to Fitz and his new friend, fellow scientist Holden Radcliffe, who has designed and created an android called Aida, which can mimic human behaviour with ease. This is something which I hope gets developed later on down the line as it could have Ultron level implications.